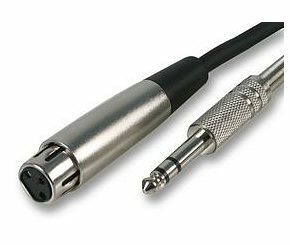 1m XLR socket to 1/4 Inch Jack Plug Cable, stereo (TRS) balanced audio cable. 3 pin XLR socket to 1/4 inch (6.35mm) jack plug. For stereo Tip, Ring, Shield TRS applications. Features flexible, fully screened cable with pure copper conductors. 0.5m 3.5mm jack to jack plug cable. A High Quality 0.5m 3.5mm to 3.5mm Jack Plug cable. Oxygen Free Copper cable. Metal bodied 3.5mm connectors with gold plated contacts. Ideal for hi-fi and audio applications. Profigold PROI5202 2m IPod audio video cable, potable audio interconnect with video. Profigold PROI5202 Ipod AV cable, 4 pole 3.5mm to 3 x phono RCA cable. Superior grade 99,996% Oxygen Free Copper conductors, for lowest possible signal loss. Multiple cable shielding, for maximum protector against radio frequency interference. 24k hard gold plated contacts for excellent protection against corrosion. Pearlized chrome plated metal connector with metal inner case, for maximum reduction of RF & EMI interference. Superior flexible whiter outer cable jacket, to avoid cable twisting and cable fracture. Color coded plugs for easy and secure installation. Precision silver soldered contacts, for minimum transition resistance. Slim-line 4 pole 3.5mm connector, complies with Apple iPod, iPhone and iPad. Interference Absorption Technology to eliminate interference in the signal transfer. Length 2 metre. 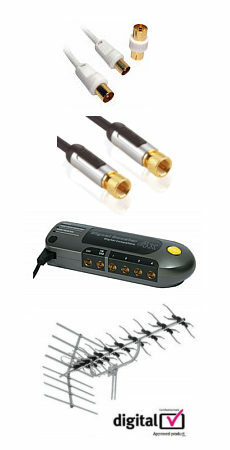 Prosignal 1.5m 2x Phono + S-Video to Scart Cable wired for stereo audio and s-video, features:- Cast metal body connectors for ultimate shielding Gold plated contacts for low resistance reliable connection. Oxygen free copper (OFC) cable for perfect signal transfer. Please note this is a directional cable signal IN to scart, eg from phono and s-video sockets on a DVD player to scart socket on a TV. HQ Silver Series Scart to Component Video Cable 10m HQ Silver Series scart to component video cable features 3 RCA plugs on one end and a scart plug at the other. Compatible with Topfield PVR5800 digital tv Box Length 10m. 99.96% OFC conductor (Oxygen Free Copper) for low loss high quality pictures. 24 Karat gold plated contacts prevent corrosion for long-life optimum signal transfer. Double screening for maximum RFI protection to ensure superior video performance. Low density poly-ethylene insulation reduces signal loss and improve transmission quality. Metal connector design provides maximum shielding. A flexible PVC outer jacket and strain relief design provide optimal cable protection and a prolonged service life.